MELBOURNE • Defending champion Roger Federer said he was relishing the opportunity to play against South Korean Chung Hyeon, after the Swiss swept into a record 14th Australian Open semi-final with a straight-sets win over Tomas Berdych yesterday. Second seed Federer cruised to a 7-6 (7-1), 6-3, 6-4 win in 2hr 14min at the Rod Laver Arena and will face the unseeded Chung tomorrow for a place in the final. "It's great to see new names on the scene. He reminds me a lot of Novak (Djokovic)," Federer said. "He's incredibly impressive in his movement, he reminds me a lot of Novak the way he is able to slide forehand and backhand and use the hardcourt as a claycourt. "He gets balls back and stays aggressive in defence, so I'm really excited to be playing him, he's got nothing to lose, I will tell myself the same and we'll see what happens." Bespectacled like Clark Kent but playing like Superman, world No. 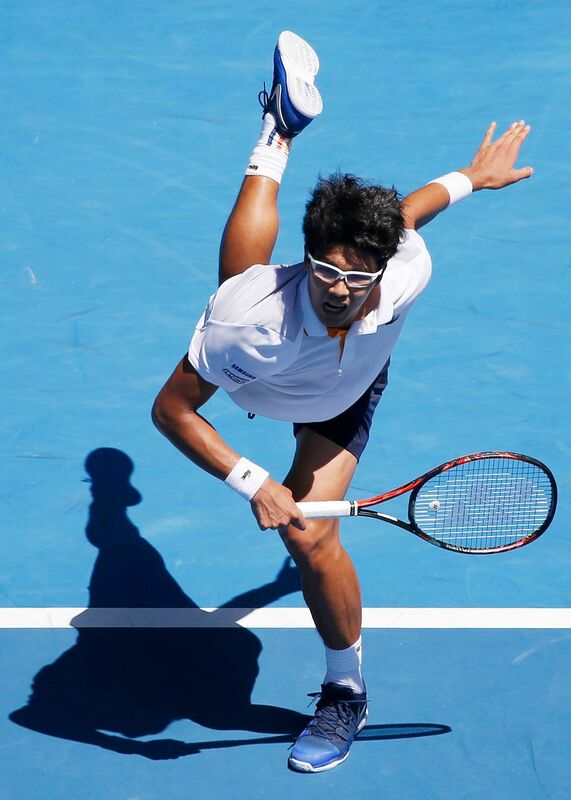 58 Chung became the lowest-ranked semi-finalist at Melbourne Park since Marat Safin in 2004. He tossed American Tennys Sandgren aside 6-4, 7-6 (7-5), 6-3 to also become the first South Korean to reach a Grand Slam semi-final. The 19-time Grand Slam champion Federer, who has not lost in five matches against Berdych in Melbourne, will play in his 43rd Grand Slam semi-final, a record in the post-1968 Open Era. The Swiss legend has yet to face Chung, who stunned six-time champion Djokovic and world No. 4 Alexander Zverev to get to the last four. I think just these late night matches they should cancel. I went to sleep at seven in the morning yesterday. KAROLINA PLISKOVA, 25, complaining about her fourth-round match with fellow Czech Barbora Strycova which ended at nearly 2am on Tuesday morning. Pliskova lost 3-6, 2-6 in the quarter-finals yesterday to Simona Halep, who had more rest as the Romanian played against Japan's Naomi Osaka in the afternoon on Monday. Federer's latest victory was his 92nd in 105 matches in Melbourne to make the Australian Open his most successful Grand Slam in terms of matches won along with Wimbledon (91 in 102). "I'm happy I got out of the first set. It ended up being the key of the match," Federer said on court after his win. "Tomas played well in the first couple of sets especially. I think in the third set he dropped a little bit. "It was tough in the first set. Could have gone either way. He deserved it. I stole that one a little bit." Federer has now won 14 out of 14 quarter-finals in Melbourne and has yet to drop a set this year. The 36-year-old is bidding to win his 20th Grand Slam title and is the oldest man to reach the semi-finals in Australia since Ken Rosewall (42 years) in 1977. In the women's quarter-finals yesterday, 2016 champion Angelique Kerber of Germany swept aside Madison Keys 6-1, 6-2, easily taming the American's big serve and will go into her clash with world No. 1 Simona Halep on a 14-match winning streak. Top seed Halep was equally impressive on the Rod Laver Arena in thumping sixth seed Karolina Pliskova 6-3, 6-2, after going 0-3 behind in the first set.